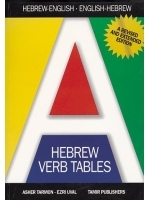 A classic for twenty years, now this updated edition includes Hebrew verbs in current usage, 235 tables, and a comprehensive index. This book will provide the Hebrew student with every possible verb combination making verb translation much easier. This book is a neatly organized verb index to strengthen my vocabulary. Slim, thorough and probably contains every verb you will ever need to know.